UPDATED: Sign the Petition: Plan To Attend Community Board 11’s OCTOBER 1st Meeting: Stop Noisy Bars From Expanding Into Our Backyards. Click on image above to enlarge: see which buildings will be affected by noisy drunks, kitchen odors, and cigarettes from Earl’s Beer and Cheese expanding in the backyard at 1259 Park Ave. (97th & 98th). “BREAKING NEWS” Community Board 11 has advised us that Earl’s has withdrawn their application (to expand into the backyard at 1259 Park Avenue) from the September 3rd meeting, and that they plan to re–present it WEDNESDAY, October 1, at 6 PM. 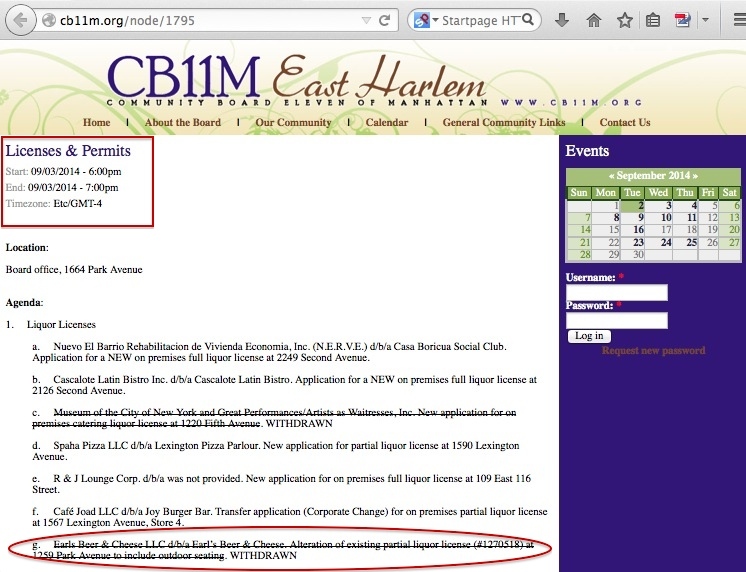 97-98 LexPark Neighbors still need to sign the Petitions, AND be prepared for Wednesday October 1 at 6 PM to attend the October meeting at Community Board 11, 1664 Park Avenue, between 117th and 118th Streets, to oppose the expansion of Earl’s Beer and Cheese into the backyard behind 1259 Park Avenue, between 97th and 98th Streets. VIP: Please call or email us with contact info or a phone number in case the Community Board meeting location is changed due to extra attendance! Even if you do not live in or immediately adjacent to 1259 Park, YOUR BUILDING WILL BE EXPOSED TO THE NOISE, cooking smells and cigarette smoke; and if this bar is allowed to expand, our 97-98 Lexington/Park Avenue neighborhood will turn into a haven for loud, late night bars with crowds and noise. Don’t we have enough noise from the ambulances, the buses stacked up on Park Avenue, and the cross-town traffic across 97th Street? Do we have to stay up all night listening to people “partying” till 2 AM every night? Community Board 11 can refuse permission for the expansion, if they hear from enough neighbors whose quality of life will be heavily diminished by the noise, cigarette smoke, and the rowdy crowds that this bar expansion will bring. Earls Beer & Cheese LLC d/b/a Earl’s Beer & Cheese. Alteration of existing partial liquor license (#1270518) at 1259 Park Avenue to include outdoor seating. Are you excited about a beer joint in the backyard adjacent to your bedroom windows? Are you looking forward to hearing intoxicated people shouting and laughing outside your windows, blasting music and cigarette smoke? Impatient to hear the clinking and clamor of beer bottles and glasses all through the night, as you try and rest from your stressful job, or as you or your kids try and study for an exam? 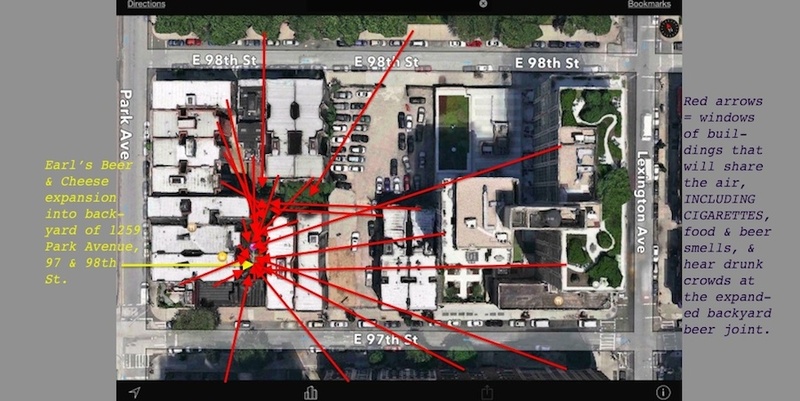 Re the photo above, the red arrows show you the 13 buildings whose rear apartments either surround the backyard or are adjacent and share horizontal air and noise exposure with it. Over a dozen buildings with hundreds of neighbors in rear-apartments face ether directly into the above yard, or their rear yards abut and share the air (and sights, sounds and smells) with Earl’s proposed backyard bar expansion. Add in the high rise at 1510 Lexington, hundreds more neighbors will be within a few hundred feet of the shared airspace leading to the expanded outdoor bar, with the noise echoing through the narrow canyon of the backs of those brick and masonry buildings. FYI, they have already started gutting the backyard and changing the grade without any building permits, showing their contempt for their neighbors’ safety, and for the law… Not a good sign of their future conduct. Talk to your neighbors tonight and tomorrow, and have them sign the online and hard copy petitions as soon as possible. Prepare your neighbors to come to the CB meeting in early October (sign up for email alerts and check back for the exact date) and say “NO” to turning our block into a mecca for beer joints and singles bars. Remember, even if you don’t live directly on top of or adjacent to 1259 Park, if we don’t stop this one, the next one could be directly under your window.